I’m working with a GIS that uses SQL Server as its DBMS. 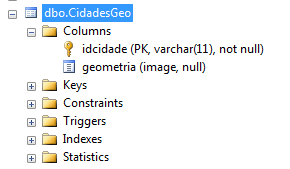 So I have to insert some data into a column called dbo.CidadesGeo, but before do that I have to understand how the geometry (geometria) column works. In addition, idcidade = idcity. I’d like to convert this image type into WKT, then I could see how the coordinates looks like. Could someone help me with that? Browse other questions tagged geometry wkt or ask your own question.